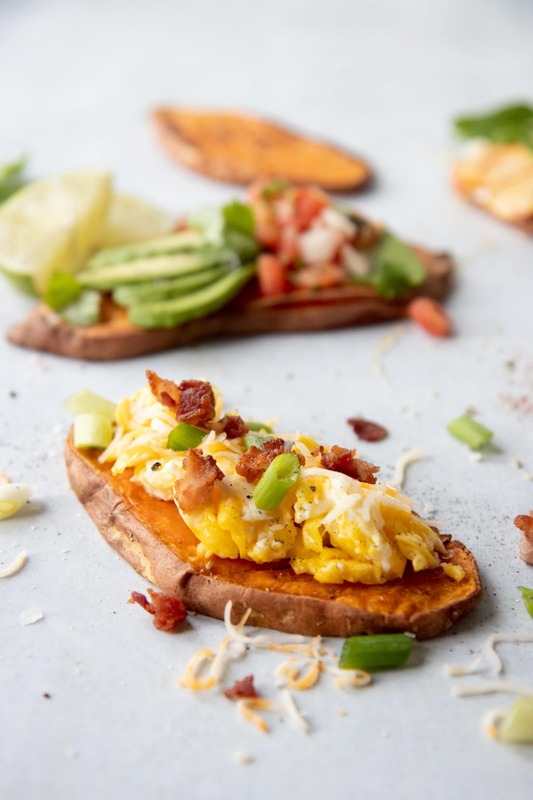 Sweet potato toast is the easy, grain-free way to start your morning. 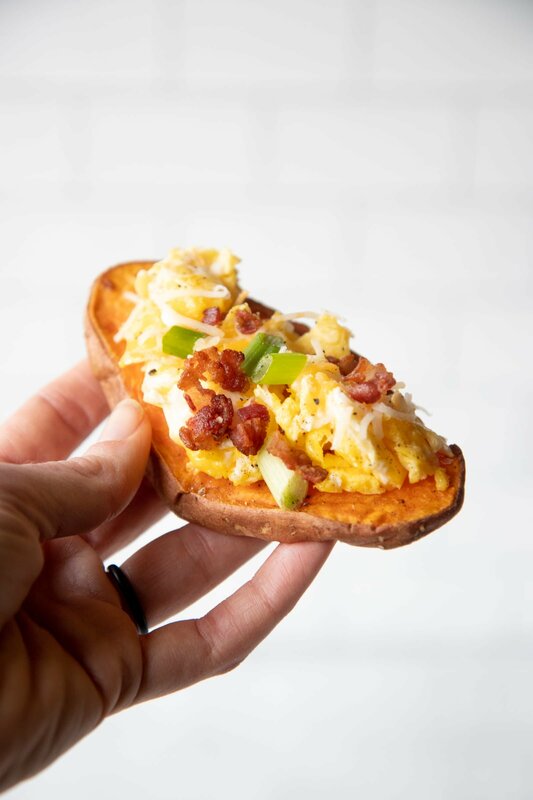 Here’s how to make perfect sweet potato toast every time, and four ways to top it. 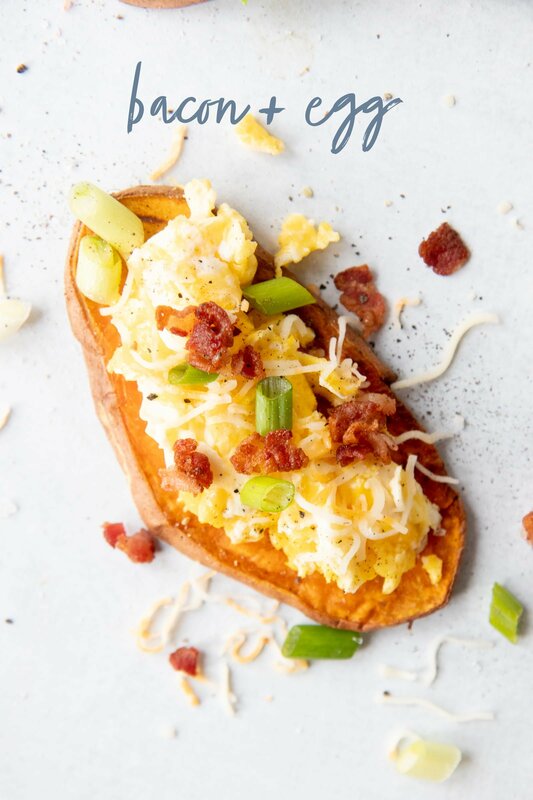 I’m low-key obsessed with sweet potato toast, friends. 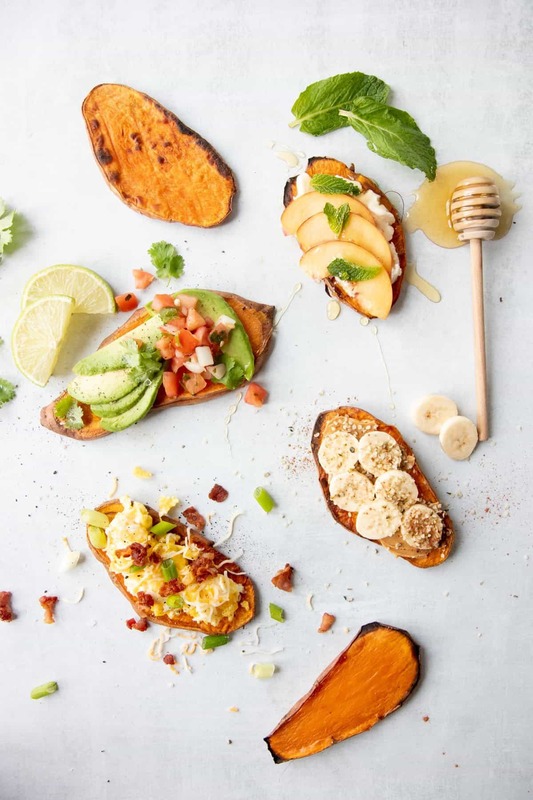 If you’ve never heard of it before, sweet potato toast isn’t some new fancy sweet potato-infused bread you get at your local natural foods store—it’s literally just cooked planks of sweet potatoes that you use in place of bread in your favorite toast combinations. 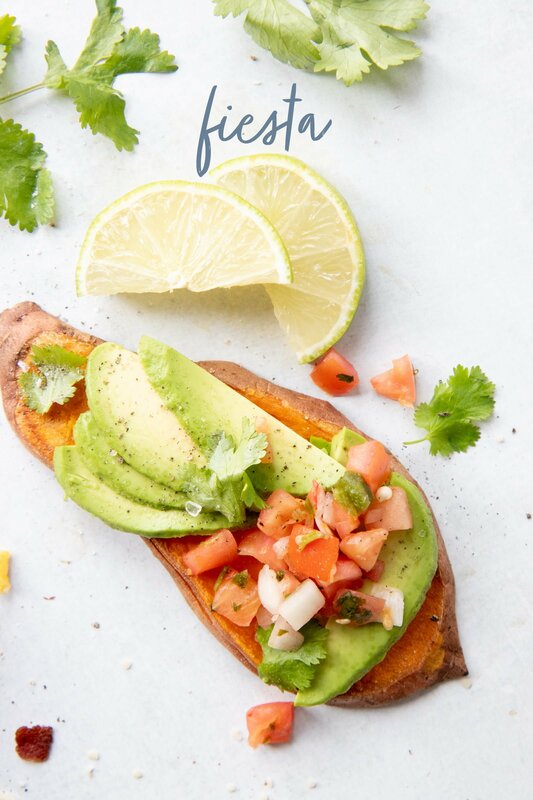 It’s so beautifully simple, and it adds so much awesome flavor, texture, and nutrition to your daily dose of avocado toast. 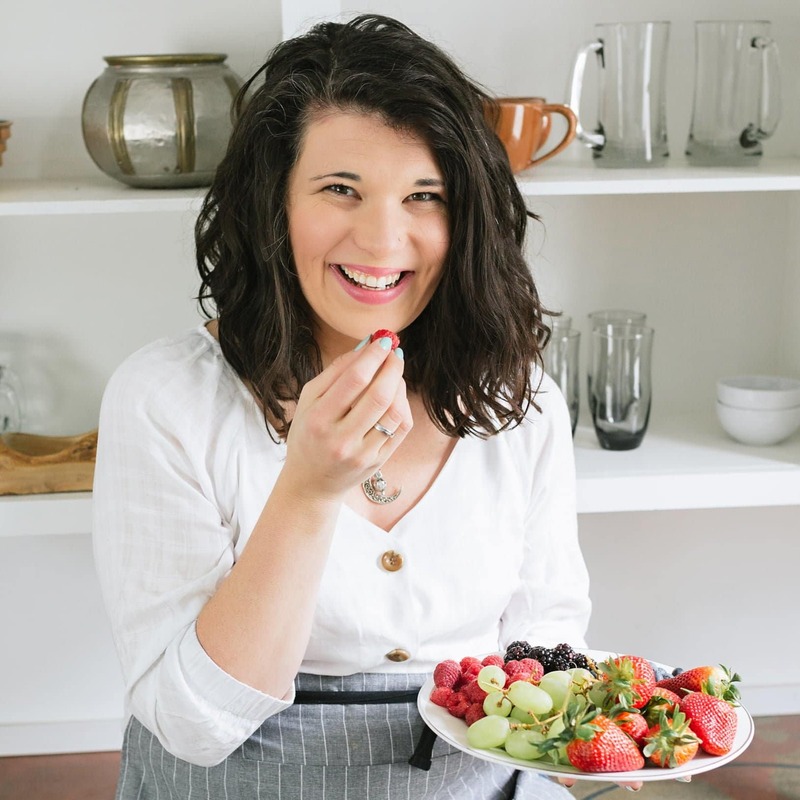 And if you happen to struggle to digest grains, it’s a wonderful gluten-free, grain-free alternative to sandwich bread. 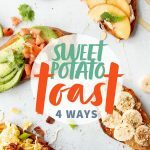 Most sweet potato toast recipes will tell you to simply slice your sweet potatoes into planks, and then plop them in the toaster for a few rounds. I have to tell you, I have never had success with this method. I don’t know what kind of magic toaster people have that I don’t, but using this method always gives me toast that is burnt and crispy on the edges and uncooked in the middle. And it takes FOR-EVER. 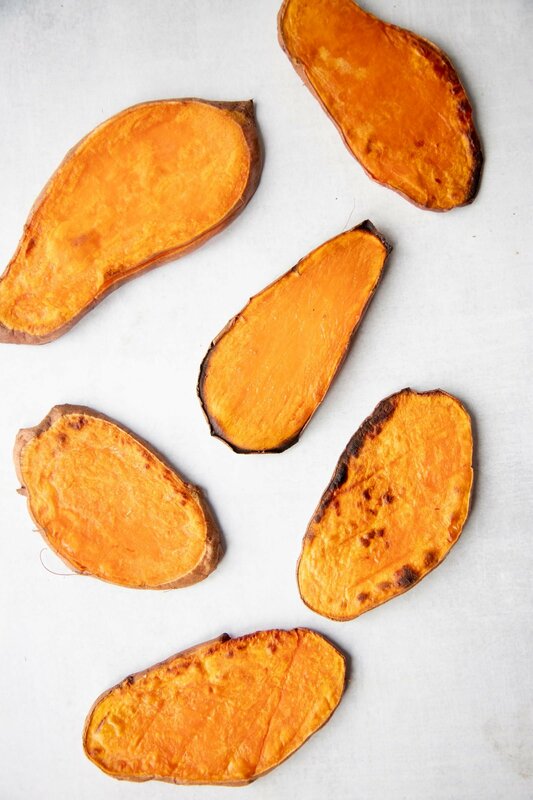 For me, I’ve had the best luck par-baking (AKA: precooking) my sweet potato planks in the oven, and then stashing them in the fridge until I’m ready to toast. I do this during my weekly meal prep session, so the planks are ready to go whenever I want them. When it’s time to make my toast, I take the planks from the fridge and pop them right in my toaster for one round of toasting. 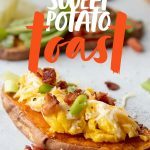 This always produces a nice, sturdy piece of sweet potato that is cooked all the way through and just begging to be topped with all kinds of deliciousness! You’re looking for chubby sweet potatoes for this—the wider the better. Save the long, skinny sweet potatoes for another use. 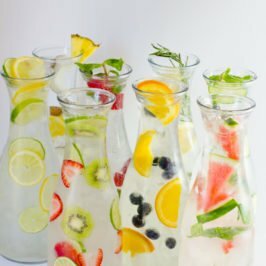 Don’t make your slices too thin! If you have a mandoline slicer with an extra thick slicing attachment, you can use that to get good slices. However, many mandolin slicers don’t go thick enough to create good, sturdy slices. I prefer just a good knife and cutting board! You can do this with any kind of sweet potato—orange, white, purple, or Japanese. I recommend leaving the peel on for all varieties except for Japanese sweet potatoes—giant sweet potatoes with a purple skin and white flesh—the peel tends to get very chewy and just isn’t good eats. 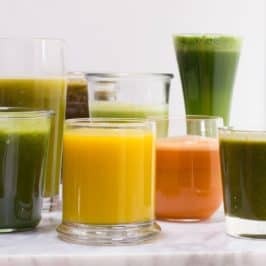 But for the other varieties, the peel stays soft and adds fiber and nutrition. 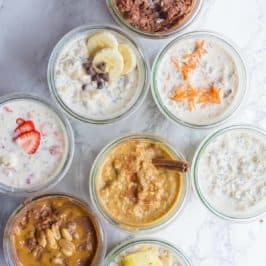 When it comes to toppings, basically anything that you would put on a regular piece of toast works here, too! Here are four of my favorite combos—two sweet and two savory—to get you started. 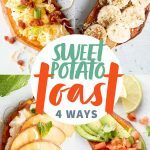 These are just a handful of ideas—your own creativity is the only limit to what you can put on top of sweet potato toast! 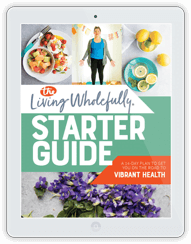 Make sure you share your favorite combos with the hashtag #wholefully on Instagram so we can see all the goodness you’re making. Enjoy! 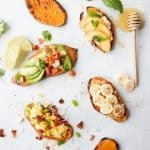 Sweet potato toast isn’t some fancy bread made out of sweet potato puree—it’s actual planks of sweet potato that take the place of bread in your favorite breakfast combos. 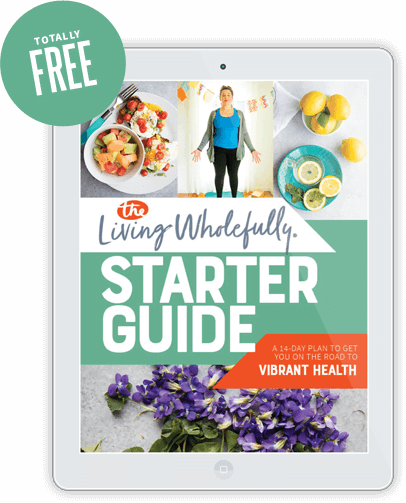 It’s a great way to swap in some healthy veggies in place of your daily bread, and it’s super easy to prep ahead. 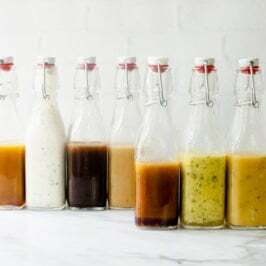 Here are four of our favorite ways to serve it up, plus, our ultimate tips for getting good, sturdy slices. Preheat your oven to 425°F. Line two baking sheets with parchment paper or silicone baking mats. Set aside. 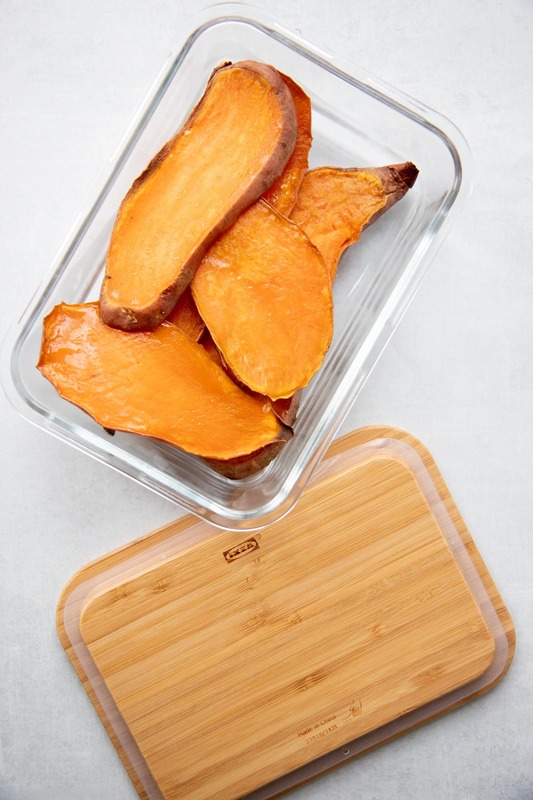 Using a sharp knife, slice the sweet potatoes into 1/3″-1/2” slices. Arrange in a single layer on the baking sheets. Drizzle liberally with avocado oil and season with salt. Roast in preheated oven for 10-15 minutes, flip, and then roast an additional 10 minutes—or until the slices are fork tender, but not totally soft. 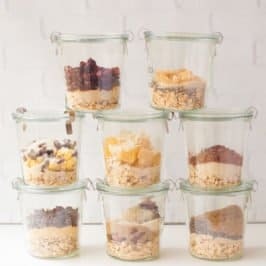 Cool completely, then store between slices of parchment paper in a glass food storage container in the fridge for up to a week. To reheat: Set toaster to highest setting, and toast sweet potato slices. Depending on your toaster, you might have better luck toasting for a second round. The slices are ready when they are golden brown, warm, and cooked through. 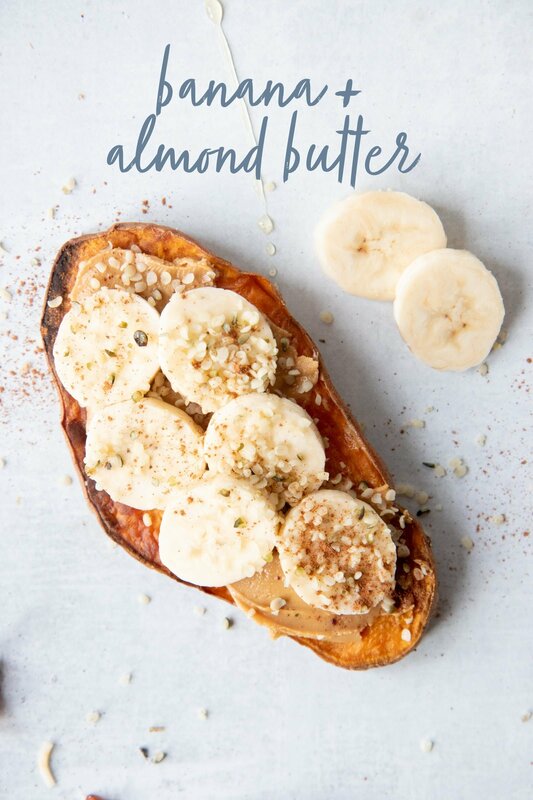 Serve topped with your favorite toast toppings. 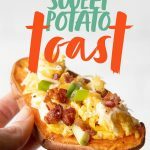 I love sweet potatoes but never tried attempting sweet potato toast. However, I definitely will now that I saw this recipe. 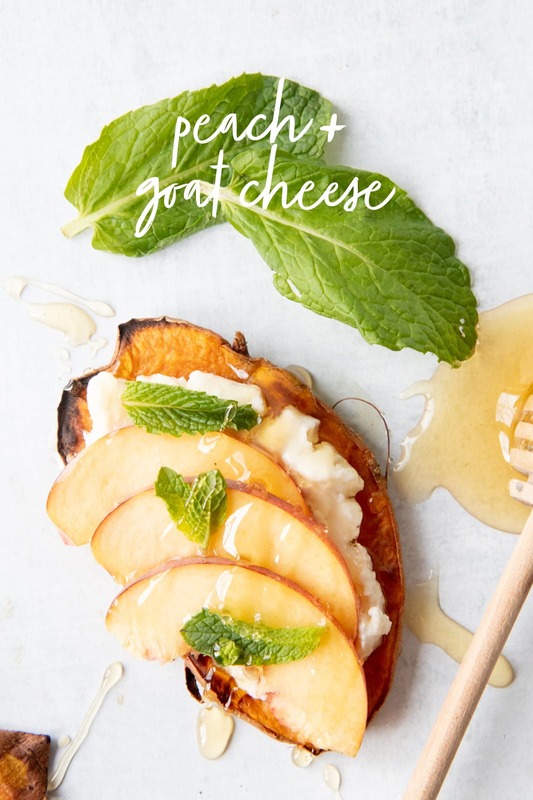 Your sweet potato toast looks really good and so delicious!